Sue Jacobs, CZT in Illinois, issued an unofficial challenge that I thought looked fun called Alphabet Soup. You can find it here. The challenge is to use a tangle from each letter of the alphabet. Sue completed hers in 5 tiles, which you can see here. Nice work, Sue! 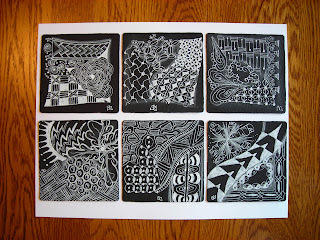 I decided as an extra challenge for me, to use black tiles and the white gelly roll pen. Even after the challenge, I still need to practice this more, especially shading with the white charcoal pencil. I jumped right in and used a lot of new tangles, without practicing them first. I tried to use tangle patterns from different tanglers too. Some of the tangles I really screwed up, but kept on going. (Sorry if it's your pattern) No mistakes in Zentangle, right! There are a lot of tangle patterns out there that I have never tried. I will use a lot of these again and will need to try more in 2012. It was also fun not knowing what would come next. I completed my soup in 6 tiles. 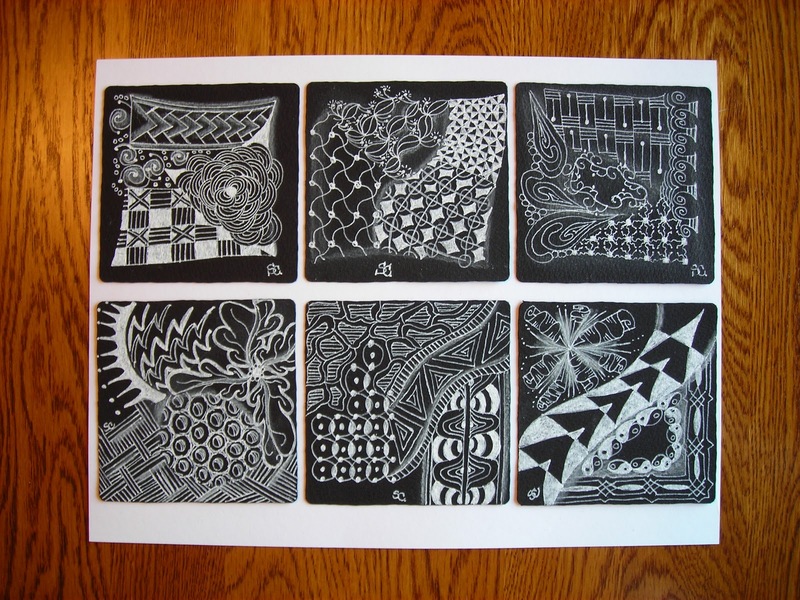 They are pictured together, but start in the upper left and go across the top row (left to right), then the bottom row (left to right). Names listed after the picture. Thanks, Sue for the fun challenge! Great tiles - Thanks for joining in. I'm lovin' seeing the variety of tangle patterns! Bilt! I see Bilt!!! :) How awesome to have my tangle picked for "B"! Thanks! Wow, looks great Sue. I have started too. Its good to have something specific to do. I like that you made a changfe and did it white on black. WSell done! Welcome to my blog about creating with the art methods of Zentangle and Alcohol Inks!